The beginning of your sea kayak adventure into the Quirimbas with Dive Quirimbas, the expert activity centre based on Ibo Island, is all about packing the dhow, loading the kayaks and donning plenty of sun cream. Imagine a holiday in Mozambique which starts and ends at Ibo Island Lodge for a few days, and is spend mainly on the water, sailing an old Arabic dhow and kayaking for miles every day? It is good to know that the kayaks used on these safaris are quite new and fabricated from fiberglass, with a rudder to steer too! After an initial four hours or so cruising along on the dhow, guests booked on the Ibo Island Lodge mobile island hopping sea kayak safaris arrive at Darumba Island, their first stop. This remote island happens to be inhabited so prepare for lots of giggling children who may come to look at your curious faces. 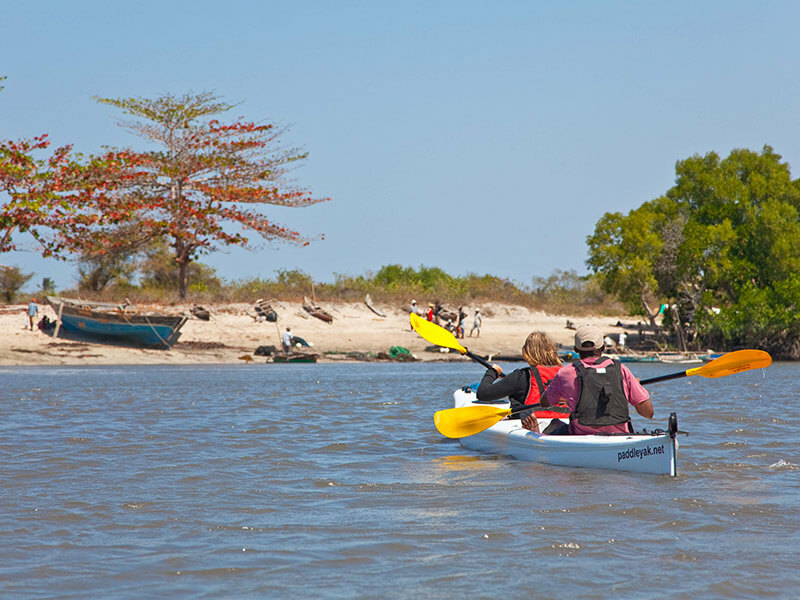 Pitch camp and set off around the mangrove swamps for a few hours to observe the wildlife and learn how to handle the boats. 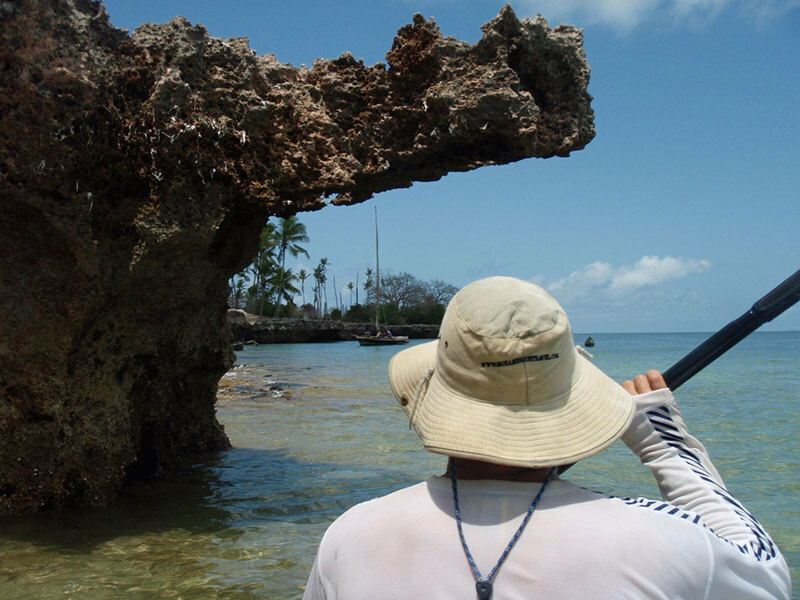 Sea kayaking the Quirimbas is not for the faint-hearted and yet, anyone who has some level of fitness can do it. If you want an excellent family holiday, be ready for kayak races, bumping games and capsizing tricks! You will love your first night in the tents – fabulous, so dark and quiet. And after a delicious fresh fish supper around the campfire, you will sleep like the dead. Your crew will guide you by sea kayak for as long as possible but the waves and tides can become too strong, in which case guests must clamber aboard the dhow, in the middle of the rough seas, hauling their kayaks in after them! Most of the time, hope for flat seas and kayak to your heart’s content. The next stop, Mogundula island is so beautiful – verdant and blue and white all converging to create a floating paradise where only kayakers and dhow sailors come to camp every now and again. Your guide sets up your camp, sometimes right beside the sea. Sleep in comfy camp beds with basic bedding and dine around a simple table on chairs. Replace the luxury of Ibo Island Lodge with simplicity – a hole for the toilet tent and a shower tent, with water heated and put up high in a bag with a small tap! When you sea kayak the Quirimbas, your world opens up and the miraculous solitude of the islands and of the turquoise sea enters your soul and you feel renewed. Listen to the sound of the sea as you sleep, spattering gently on the shores, tapping the sides of the dhow. Spend sunny days snorkeling off the dhow, kayaking to new islands and up interesting rivers where red data bird species flit about in estuaries untouched by man. 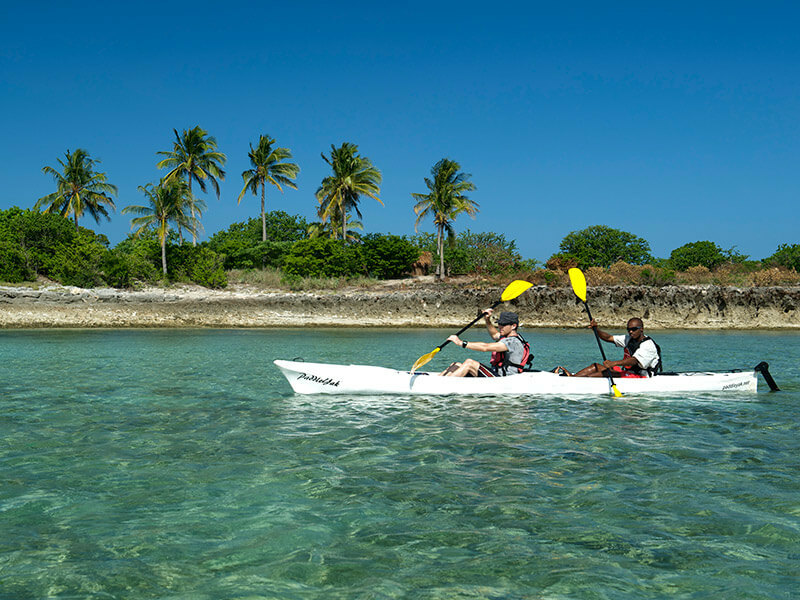 Ibo Island Lodge will surprise you with this high quality kayaking holiday so book now to avoid regret. Enquire here.